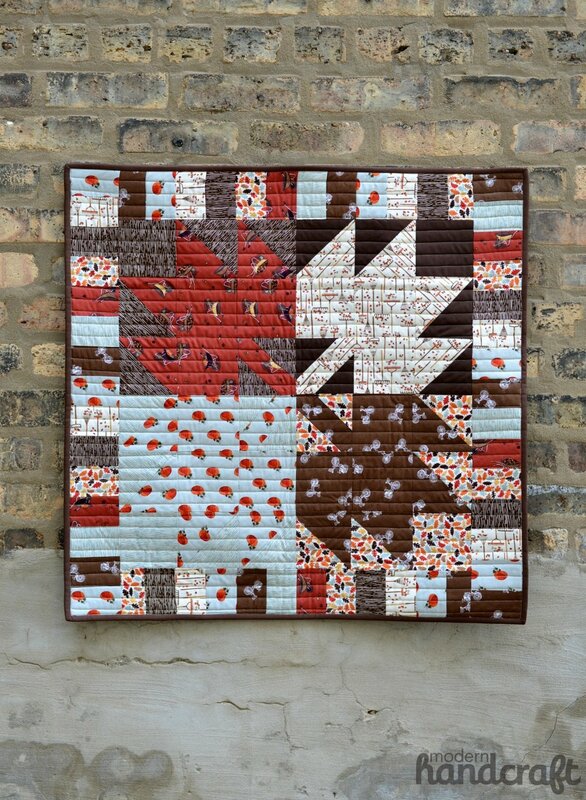 Hi friends, Fall is in the air in Chicago this week and I thought today would be the perfect day to share a project that looks as great on your table as it does hanging on your walls - The Maples Mini Quilt. This pattern is a great project for beginner quilters since you are using some basic quilt blocks. Using fun fall fabrics allows you to have a beautiful wall hanging or decorative table cover for your entire Autumn season. Arrange your 4 blocks in a square - with stems facing inside, outside or all one direction. Cut your remaining fabric into rectangles measuring 2.5" x 4" - you will need a total of 54. Sew the rectangles into 4 rows, sewing along the 4" sides. You will have 2 rows of 12 and 2 rows of 15. You can iron the seam allowances to one side. You can now join your first two strips with your maple blocks (12 rectangle strip on opposite sides). Iron your seam allowances open or over to one side and trim any over hang. Now sew your second strip (15 rectangle strip) on your remaining sides, iron and trim. You can see the extra little bit of fabric over hang, Once all four sides are added you can trim up all four sides to square up your mini quilt. Now that your quilt top is trimmed you can cut a piece of your backing fabric the same size. Make your quilt sand-which: backing fabric wrong side facing up, layer of fleece cut to size in the middle, and your quilt top facing right side up on top. You may now baste with pins or use a basting spray to secure all of your layers easily. Quilt and bind with remaining backing fabric cut into strips for binding or use a coordinating fabric. This quilt was quilted in a 1" straight line stitch. You are now finished! Enjoy your new mini quilt as a table mat for a Thanksgiving center piece or hang on the wall for the entire fall season! Thank you for stopping by friends and I hope you enjoy today's fall tutorial!